Last time I did this I got "moe"
Dojikko, but I feel like it's super inaccurate. 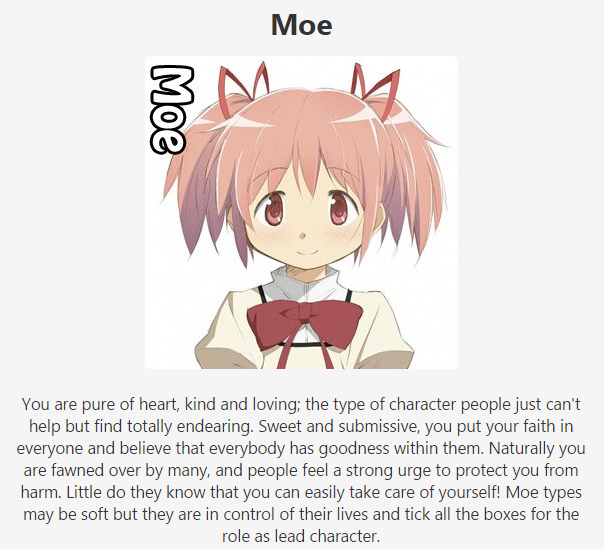 I got Moe. Anymore quizzes? I'm addicted. Description:The Kuudere type is cool-headed and logical who always thinks before they speak. They are incredibly smart- and they know it, almost to the point of becoming a little arrogant at times due to their lightning wit. They are very blunt with their opinions because they know honesty is the most efficient way to success. While seemingly cold on the outside, Kuuderes are much more friendly and gentle when in places or situations where they can relax. They use their intelligence for unselfish motives, and will always aim to find a conclusion that works best for everybody. 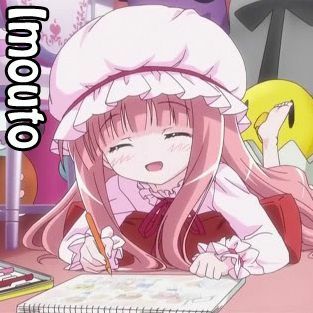 ^^^^ i'm a kuudere too! very fitting. I got a tie for these 3, but Yandere showed up. 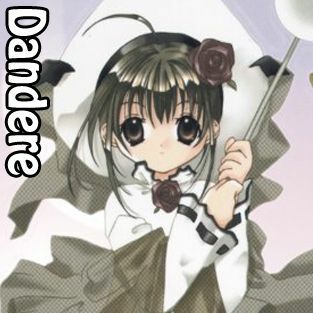 Friendly and sweet on the surface, the Yandere hides a dark and twisted character underneath their smile. While normally an amiable person to hang around with, if somebody happens to emotionally hurt them then they will have befallen a terrible fate. 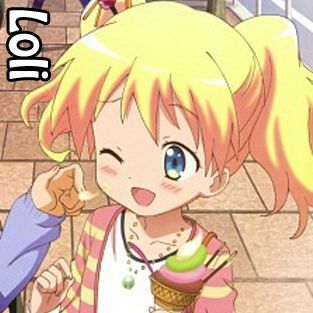 Yanderes are unstable, and become unhealthily obsessive with their friends and objects of desire to the point of doing crazy things just to please them; and then when other people come into the mix, the bitter, irrational jealousy begins. 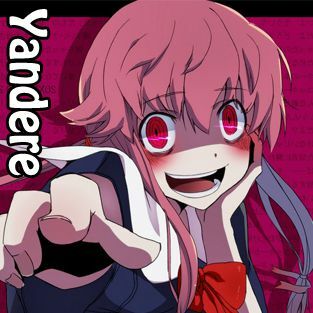 Beware of the Yandere, for they surely have psychotic tendencies. 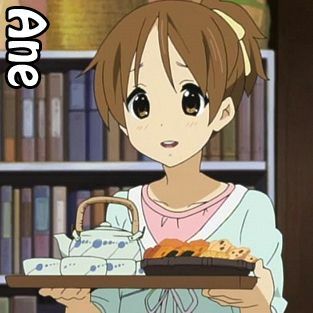 Ane means "big sister". Ane characters are the most reliable and kind-hearted people, forever putting others before themselves. They have a down-to-earth outlook towards life and are very mature for their age. Friends say they are wise beyond their years. Anes like to take care of others due to their caring and parental nature, and have a deep protective streak. They know the best advice to share with friends when they have a problem, and their handy practical skills are always useful for when someone needs an extra helping hand. Well . . . this is embarrassing, but its true? I'm still into crazy fantasy and beautiful princessy stuff. And I am very slow! The funny thing is, I also love creepy things. Genki types are forever running on supercharged batteries. Full of energy and sunshine, they bring motivation and inspiration to their friends just from being themselves. Often their excitable disposition can be too overwhelming for people, but they are usually oblivious to their own antics. Genkis live for the moment and will not let any good opportunity pass them by. They live and breathe for positivity and want to bring out a smile in everybody- even if they have to force it out of them.